Having trouble hearing the sound on your Microsoft Surface tablet, even with the volume turned all the way up? A simple accessory called "Ears" can help solve that problem. 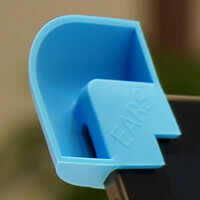 "Ears" are small silicone pieces that fit over the top corners of your Surface slate. Covering the speaker, they redirect the sound to the front of the tablet, bringing a 10dB increase in the actual volume. It also makes the sound a lot clearer.